I am a Peace Corps volunteer in Moldova, in Eastern Europe, serving in the small city of Ialoveni with my wife, Champa. 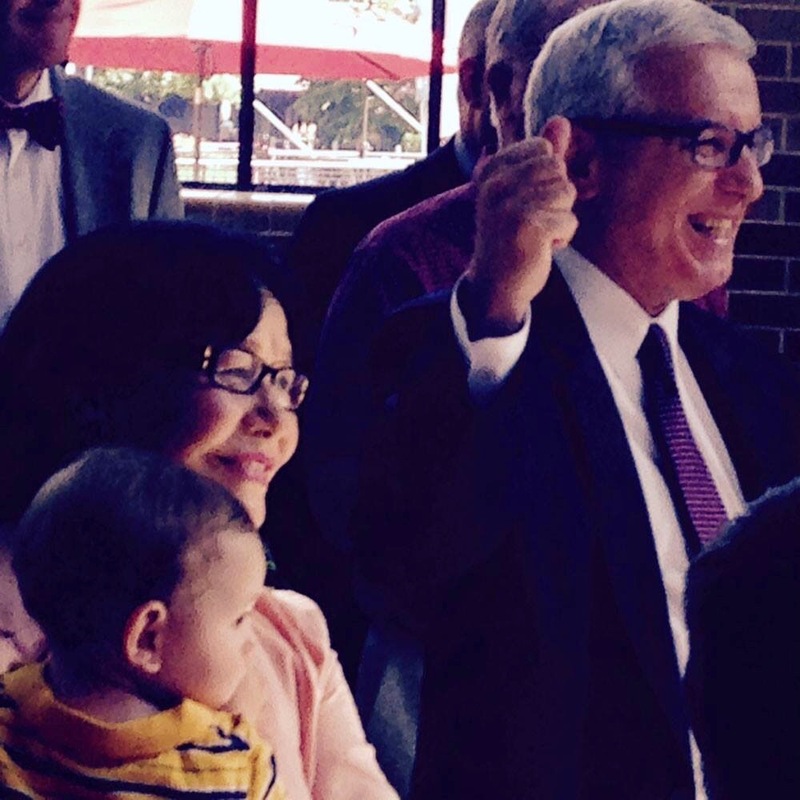 We are from Durham, N.C., where I was the head of news and communications for Duke University. You can follow our adventures on my blog, notexactlyretired.com. Almost every family that likes to travel has one person who does the planning. In our family, that’s me. I’ve always considered planning to be half the fun of a trip — figuring out where to go, what to eat, where to stay. As you can see from the photo, I’m now focusing on our upc oming stops in Pittsburgh and Cleveland, reviewing brochures and checking information online. Champa and I will be leaving Philadelphia tomorrow, after spending two great days with our family, and I have a pretty good idea what we’ll be doing for the next stretch. That won’t surprise anyone who has worked with me. I’m a planner who likes schedules. Until last night, however, the extent of my planning for Pittsburgh was to know it is west of Philadelphia, along our general route. I deliberately resisted my natural urge to spend hours on TripAdvisor or local websites coming up with a detailed plan. 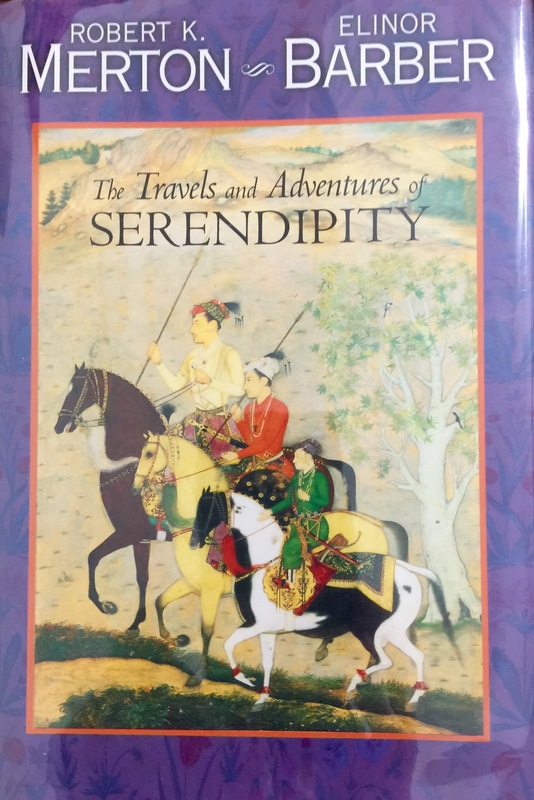 For there and elsewhere, I have tried to keep our trip open to serendipity, or at least to keep planning to a minimum. If we’re so busy racing to Site No. 4 in a city, I figure, we may not spot the charming church fair or local pie stand along the road, much less stop to take a look. I’m not sure Pittsburgh and Cleveland have appeared often in the same sentence as “serendipity,” and the top photo shows I will retain my planning instincts no matter how serendipitous my current intentions. Still, I know there has to be a better balance between the two, and I want to find it. Louis Pasteur famously noted that chance favors the prepared mind. And, yes, Drew Carey famously noted that Cleveland rocks. So bring it on. North Carolina friends, Maryland friends, let me ask you both a question. I’m going to describe a city. You need to guess which one it is. Readers in other states or countries are welcome to guess as well. Ready? OK, this city is not large, but it’s not tiny, either. It’s well-known within its larger metropolitan area for its ethnic diversity, liberal politics and funky charm. 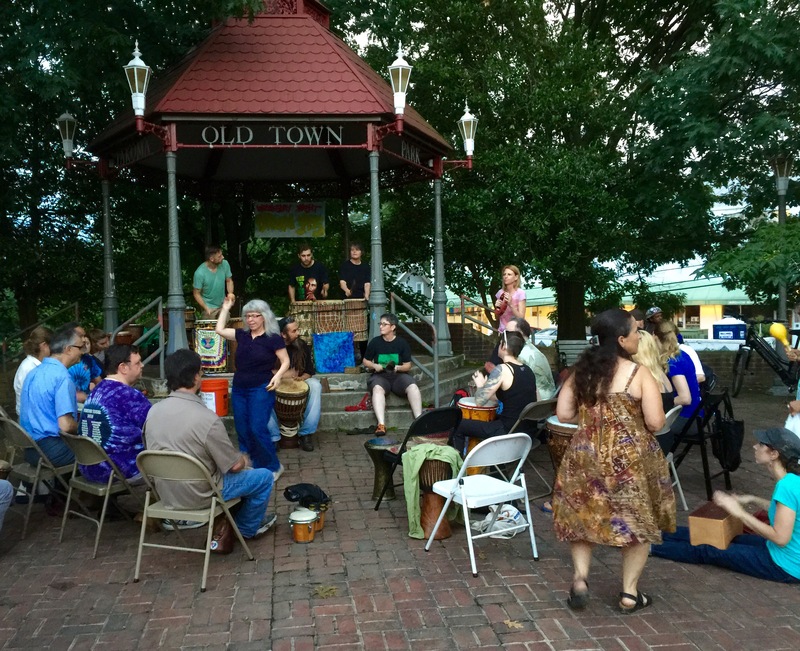 It has a vibrant farmers market and a disproportionate number of people with Obama bumper stickers, not to mention people our age who still gather at the local gazebo to play drums on a drizzly Thursday evening, as seen below. There are great local restaurants and a lively music scene. Because of its many charms, it faces both the benefits and challenges of gentrification. Oh, and one more thing … Champa and I lived here for many years. North Carolina readers: The answer is Durham, right? Well, in most respects, yes. 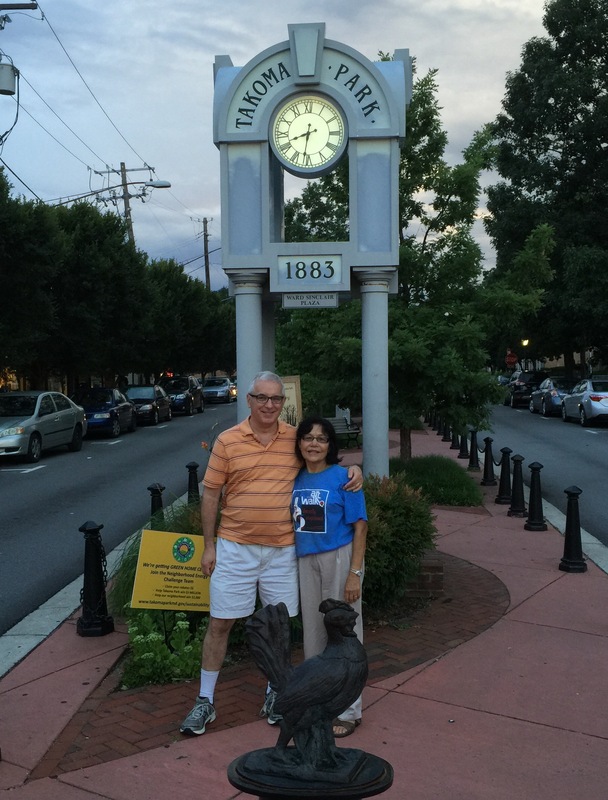 But today I’m describing our former home, Takoma Park, Maryland, where we arrived yesterday on the first leg of our journey. Along the way, we stopped at the National Air and Space Museum center near Dulles Airport. It’s fun to be back. Today we’ll be spending the day at the National Portrait Gallery and other sites in downtown Washington. Tonight we will probably go out to dinner, perhaps at Takoma Park’s latest hot spot, Republic. It takes its name ironically from “People’s Republic of Takoma Park.” As we might say in Durham: Power to the people, y’all. My last big road trip was in 1975-76, when I traveled across Asia, Africa and Europe with my friend. This photo was taken in … wait for it … Kabul, Afghanistan. Suitcases are now strewn across our bedroom as we get ready to load up our car for our big road trip, which starts tomorrow morning. I find myself thinking back to the last time I set off on a major road trip, in 1975. I had just graduated from college and left to backpack around the world with my friend, Mitch. (We’ll be visiting him in Portland in a few weeks.) He and I traveled for seven months across Asia, Africa and Europe. We visited Belgium, France, Switzerland, Greece, Turkey, Iran, Afghanistan, Pakistan, India, Nepal, Kenya, Tanzania, Uganda, Sudan, Egypt and Italy. The entire trip cost $2,100 each, airfares included. 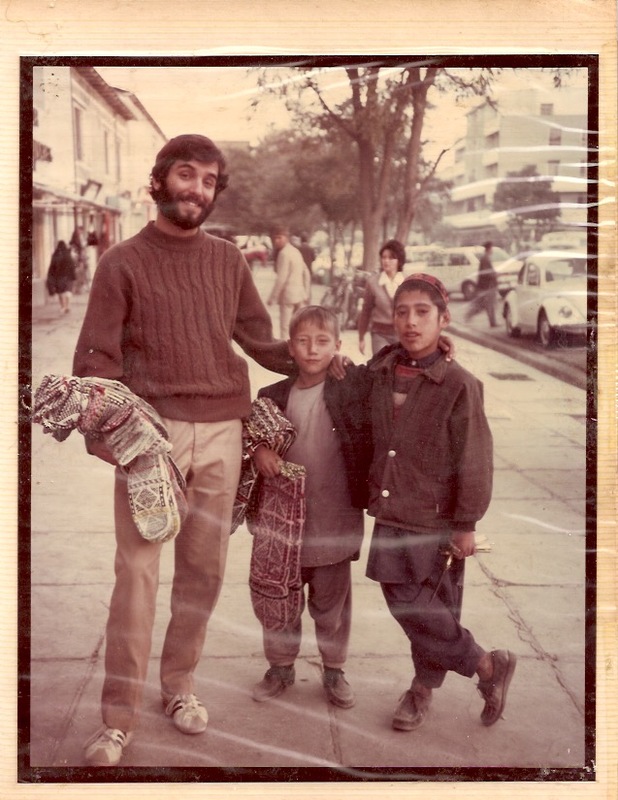 Along the way, we traversed the Khyber Pass, hiked the Himalayas, were arrested by Idi Amin’s goons in Uganda and had too many adventures to count. That trip changed my life, making me more self-confident and curious about the world. A year after we returned, I joined the Peace Corps in Nepal, which also proved transformative, and not only because I met Champa. Travel showed me the possibilities life offers, which our daily routines tend to obscure. Mitch and I traveled with only backpacks. Tomorrow, Champa and I set off in a Ford Fusion crammed with clothes, gifts, brochures and snacks. I know she and I won’t see those two Afghan boys who sold me a pair of colorful woolen socks on the streets of Kabul in 1975. But I’m confident something else is waiting to make us see differently. Our friends at Duke sent us off in style at this farewell party. In three days, we’re heading off on a two-month trip across the United States. We’ll be driving across the top of the country, to Seattle, then down the Pacific Coast to San Diego. From there, we’ll drive east across the bottom of the country, through Texas, eventually working our way back to Durham. After a brief break, we’ll depart for another two months, this time to Nepal, where we met back in 1977. And after that … well, who knows? We’re taking these trips to help us figure out the answer. We invite you to make the journey with us. Are you ready? We are.